Discussion in 'Pokémon Guilds' started by BGP_, Jan 1, 2010. 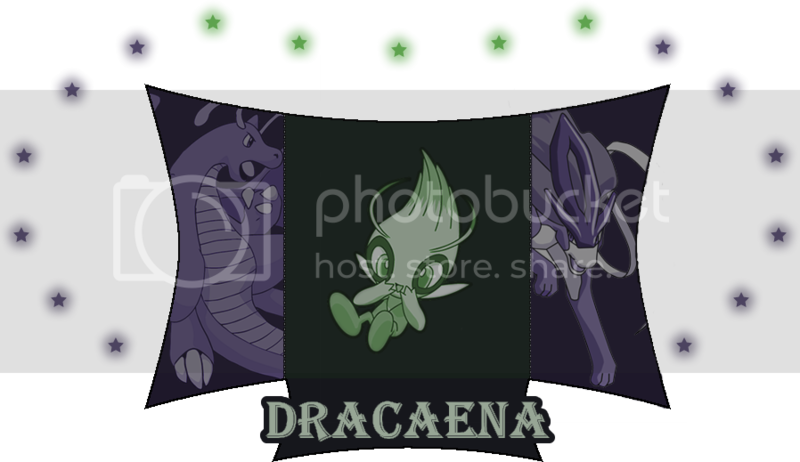 Welcome to Dracaena - Home of Nature's Dragon. Dracaena hopes that members can form new, long lasting relationships and improve their battling skills. Dracaena's ultimate goal is to have as much fun as possible. We're a laid back guild that just likes to have fun and be social. You don't live so long trying to do anything and everything without having member loyalty! Loyalty is the one thing we stress and we're proud to have so many loyal and great members. Without them, this guild's success would not have been possible. If you have any ideas for the guild just pm any of the leaders, we're always open for new ideas to try and make the guild better. Be sure to visit the guild chat (link can be found in some sigs, or you can just ask for it). 2. To join, fill out the application below and post it to the thread. Please post the following application or send it to BGP_, Purple_BlitzXD, or TheMourningKing as an application, preferably whoever's group you're joining if you PM. You will not need a test battle in order to join. Did anyone recommend you? If so, who? *If you don't get a response via PM from your leader or they're away, post your application on the thread and we will add you on the spreadsheet to try and keep things up to date so the leader isn't overwhelmed when they come back. *Chat: Ask for it or it's in my signature and the spreadsheet. THIS SECTION IS STILL BEING WORKED ON! Our rank up system is modeled after an RPG system. That means EXP, skills, boosters, etc. Each group has 8 tiers that you can level up in. There are 3 different types of EXP to gain: Battle EXP, Community EXP, and Tournament EXP. You get Battle EXP for doing well and partaking in battles, Community EXP for participating in practically anything, and Tournament EXP based on tournament participation/performance. The EXP you get for these determines that category's level. Category levels become increasing difficult to raise as you get higher. A full list of the required EXP for every category level can be found on the guild spreadsheet. EXP can also be awarded in halves. If rounding is necessary, we will generally round down for reduction modifiers and round up for boosters. Methods for gaining EXP and BP can be found in the spreadsheet. *We'd appreciate if you would keep track of a few things you've done and post them every so often so we don't have to update every little thing. You may help keep track of your own values so long as you're doing so correctly. *We are tracking everything, including tier placements, in the spreadsheet so we can keep after each other's groups in case someone is unable to. 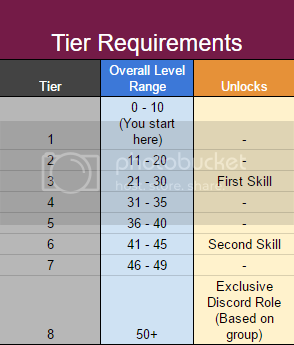 As seen in the previous table, you have the ability to obtain 2 permanent skills by reaching tiers 3 and 6. Whenever you reach these ranks, you can post saying which skill you would like to have. These have a variety of effects, and a full list of obtainable skills can be found in the spreadsheet. Each group also has its own group skill that all members of that group will have. This skill will give a 1.5X boost to certain EXP, but a .5X reduction to another. It is best to choose wisely which group you would like to join based on this. One of the obtainable skills, however, can negate the negative effect of your group skill. Some skills can also be used as boosters for a one time use in exchange for BP. More on that below. Boosters can be thought of as items. Boosters can be bought for a variety of effects, usually involving ways to increase EXP/BP or affecting skills. Some of the skills are able to be used as a one time use booster in exchange for BP. These again will all be listed in the spreadsheet, but boosters are bought using BP. Kingothestone and Ðew™ like this. Earn 1.5X Community EXP (rounded up), but .5X Tournament EXP (rounded down). Astral Shadow and Ðew™ like this. Earn 1.5X Battle EXP (rounded up), but .5X Community EXP (rounded down). Earn 1.5X Tournament EXP (rounded up), but .5X Community EXP (rounded down). Tournaments will be kept track of here. To view brackets/completed tournaments, see our challonge page. Any special activities/events will be recorded here. Activity: Currently making a transition to 5th Gen. 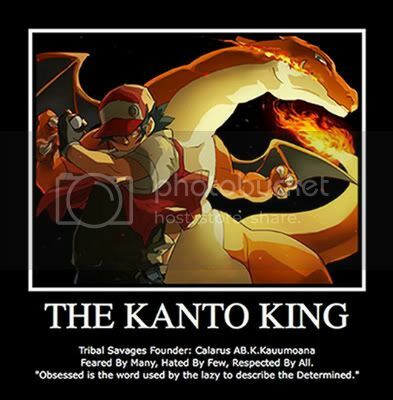 Still battles in 4th Gen. Battle Style: Pokemon Online. Um Cal, cant u just copy paste, the pm i sent you. It has the intro for the shop, and the spoiler including the pokemon. Then just add whatever you need. BTW just copy/paste over your first post through editing lol. i was wandering , what was this thread about?? Sure, what the hell, I'll join. Bruno's Phrase- " How many people do I have to Strait-Up OWN to get some respect around here? " I am Leader Bruno. Challenge me if you dare. I think, I'm a member now. I sent my sign-up to Hiro____. Anyways, hi. lol yes, welcome to the clan. 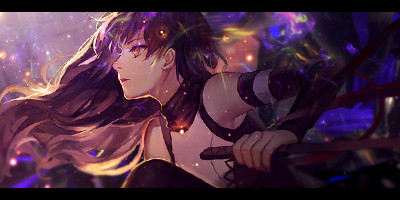 EDIT: Also, due to school starting again, i'm gonna be ultra busy 'cause i want to get straight A's this quarter... but i'll try to be on for at least an hour anyway. :/ if i don't reply to something for a day or two though... 3rd quarter is always most hectic for me so... Sorry! Challenger of The Official Serebii League. Hiro, you can just call me k or kac, it doesn't matter what you call me. Okay. Welcome thomas (11tjcoulombe) and bgp (bestgamepearl) lol we're getting a lot of former or current delirium members... also... i would appreciate it if people stopped posting here unless they have joined (PM or VM your application stuff to me or cal and then you can post... lol) i'm letting you people off now 'cause i know you... (TCC and Ivan...) but unless you're in the clan, don't post here please. Welcome Gonzo206... i'm just gonna call you Gonzo k?... |D lol but yeah, the clan is advancing quickly for just 3 days... already have 5 new members! but 3 are, or were, in delirium... not the point! we need to start setting up clan activities/battling etc etc so we can hopefully attract more people and move to competitive! Woot! lol k, currently doing a project... but when i'm done, i'll UU battle 5 v. 5... (lol i had 6... but then i found out roserade was OU and i was like "NOES!!! NOT FAIR!" so yeah, now i have 5.) lol don't worry 'bout fighting me though. i'm a pushover. only 3/5 of my pokes are even bothered to be EV trained... or was it only 2? |D not the point. Welcome Gonzo206... i'm just gonna call you Gonzo k? Yes! I'm in, yeah just call me Gonzo. That username was taken when i got here . I can't wait to see what's going to happen here. I know I'm going to have fun.